For most of us, air conditioners are the main divider between the outdoor environment and the indoor environment. You don’t have to live in Florida or Texas to conform to this statement. According to a recent study by the U.S. Department of Energy, it was found that around 84 percent of American households have some type of home air conditioner. Well, if you are planning to buy or install an air conditioner in your home, then there are different types of air conditioners available for you. Considering the options, it is really hard to pick the most suitable AC unit for your home. It is best to know all available air conditioner types and their basics before choosing your unit. Central Air Conditioners are designed to cool the whole house. In a central air conditioner, a compressor situated outside the house cools the air with the help of a coil filled with refrigerant. The cool air is then blown by a fan to the whole house through a ductwork. Central Air Conditioners use the same duct channels that your central heating system uses to provide warm air to your house from the furnace. So if your house already has a central heating system or established ductwork channels, then buying a central air conditioner might be an effective option for you. Otherwise, you need proper planning to install a central air conditioner. Central air conditioners are best for people who have a large family and a large home. A central AC can distribute cool air equally and efficiently to every corner of your house. The only downside of a central air conditioner is that it requires a suitable planning and comparatively a high upfront cost. Window air conditioners are the most popular form of AC used in the U.S. People who live in small apartments are the main user of this kind of air conditioners. Unlike central air conditioners, window ACs come in “Unitary” forms. Which means that window air conditioners have all the necessary parts together in one appliance. 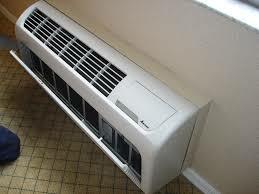 Although they are different in shape and design, the air conditioning basics are the same as the central AC. Window ACs are mounted in windows drawing hot air from the room and releasing it to the outside atmosphere while the refrigerant (a chemical liquid which cools the air) is faced towards the inside of the room. Window air conditioners are inexpensive and flexible than central air conditioners. They can be moved or uninstalled during the cold months if you want it. The major downside to having a window AC is that you can’t use the whole window that the AC is mounted on. However, considering the popularity of window ACs, it appears that this is not a big concern for many of us. For those of us, who don’t have any accessible windows in their room or don’t want to block the window, but still want to cool a single room, Through-the-Wall Air Conditioners are a great viable option for them. They also come in Unitary forms like window ACs. Through-the-Wall Air conditioners are installed by cutting a hole in an exterior wall. Before installing, a sleeve must be put into the hole. Otherwise, the wall can’t support the weight of the unit. Through-the-Wall Air Conditioners cost nearly as same as window air conditioners. But unlike window ac, they let you have access to the window which helps you have some outside air and sunlight. However, The major disadvantage of through-the-wall air conditioners is that they have to be placed permanently into the wall. So you must think carefully before installing a through-the-wall air conditioner. Portable Air Conditioners are another alternative for window air conditioners. They also come in Unitary form. A portable Air Conditioner or Space Air Conditioner is a great option for people who can’t use a window AC or a through-the-wall AC because of any building rules or restrictions. A portable AC cools the air of the room with help of a condenser coil and sends the hot air outside through an exhaust hose. The exhaust hose connects the AC unit with a window kit which directs the air outdoors. The main advantage of a portable air conditioner is not hard to guess. Yes, they are portable as their name suggests. With a portable AC, you can cool any of your room at a time, according to your need. But there are many disadvantages of portable ACs. Portable ACs are noisy since the condenser unit and the evaporator fan are placed into the same casing. Another downside of portable ACs is that they are not effective for rooms that are larger than 500 square feet. Split air conditioners are one of the most popular and updated air conditioning systems. Unlike a window AC or a portable AC system, a split air conditioner doesn’t come in unitary forms. The condenser unit and evaporator unit of a split AC, come in separate parts. The evaporator part is installed in the indoor and the condenser unit is installed at outside. They are connected through conduits, which consist of power lines and refrigerant lines. Mini split air conditioners are very effective in design since it has surpassed the disadvantages of other types of air conditioners. They don’t need any ductwork to spread the cool air and holes to mount on. Furthermore, with split air conditioning systems, you can cool different rooms with different temperatures, because of each compact unit have their own thermostat. The only disadvantage of a mini split air conditioner is that their upfront cost is greater than other types of air conditioners. 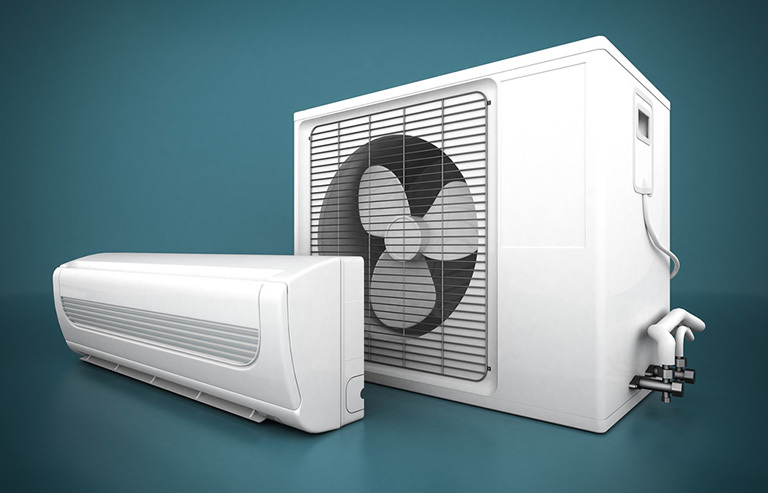 Packaged Terminal Air Conditioner (PTAC) is a unique form of air conditioner of the various types of air conditioning units out there. It is generally used in commercial spaces, such as hotels, airports, offices and many more. They are usually installed above the surface level. PTACs also come in unitary form. Packaged terminal air conditioner units are ductless. They are best suitable for any unique cooling problem. 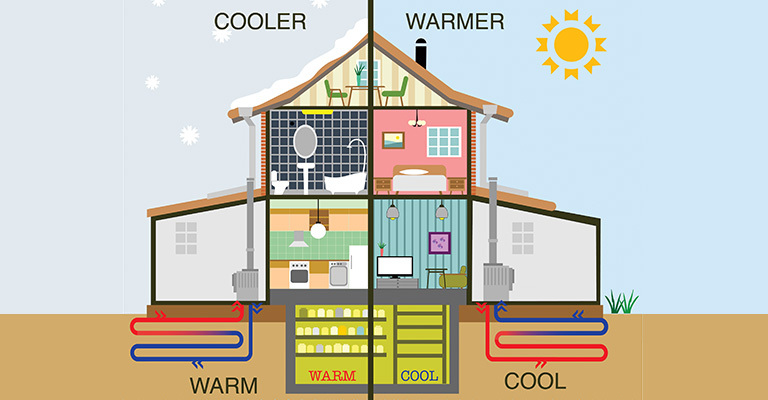 For example, if your home has a central air conditioner and there is one room or space where cool air can’t reach or heat is higher due to any reason, a PTAC would be viable solution for that room, so that you don’t have to exert extra energy to your central air conditioner only for one room. Tent air conditioner is one special kind of air conditioner that is designed for the outdoor cooling purpose. 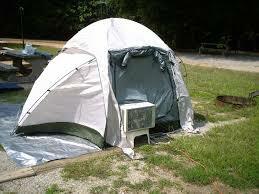 If you are camping with your friends or family in a hot summer, you could really use a tent air conditioner. Technically they fall under the portable AC category but their working principle is not like a portable air conditioner, a tent is designed to provide effective cooling to an uninsulated place. Furthermore, many tent air conditioner units can operate without ac power. Geo-Thermal heating & cooling is a new energy efficient technology that focuses on tapping the underground temperature for home heating & cooling solution. This system can provide both heating and cooling solution during winter and summer respectively. Generally, the earth beneath us maintains around 55°F always irrespective of the season. This is due to the insulating properties of the earth. Geo-Thermal technology taps this temperature by using a polyethylene piping system called as “loop” or “earth loop”. However, this technology is still too fresh to use it as a common home solution. We might need to wait a few more years to see this technology prevalent in our society. Now that, you know the pros and cons of different types of ac units, it will be easy for you to pick the most suitable one for your home amongst various air conditioner types.